Wind energy could be the largest power supply source in the EU by 2030 as long as governments drive ambition in climate and energy policies, according to a new European Wind Energy Association report. The Aiming High report suggests that wind power has the potential to exceed gas and other forms of energy within the next decade if European member states stick to the ambitious policy framework already set in place. Giles Dickson, chief executive officer of the European Wind Energy Association, said: "Wind power can be the foundation of the European energy system within the next 15 years. "Wind power makes economic sense. But policymakers must demonstrate more determination than is on show today. Wind power can deliver economic growth in Europe by boosting investments, creating jobs and reducing electricity bills. A new market design, a reformed ETS and rigorous accountability on 2030 targets are essential if these goals are to be achieved. "Already onshore wind is cheaper than any form of new power generation. Last year wind power installed more than gas and coal combined in the EU. Europe's energy and economic transition is underway. Now politicians must decide whether to accelerate this transition or drag their heels, which would damage investments and job creation." The report suggests that total wind installations in Europe could reach 392GW; with 294GW of onshore and 98GW of offshore wind. Currently the 128.8GW wind sector in Europe can power 10% of energy consumption a year. The report recommends developing renewable energy action plans, streamlining permit procedures, driving legislation to promote a fully-functioning market and a reform of the Emissions Trading System as a means to reach the 2030 target. According to the report, these measures will result in a £9m boost - the equivalent of the EU's funding for transport infrastructure – in the next five years. It is believed that this boost would also support 366,000 jobs directly and indirectly linked to the wind sector. A this week's EWEA 2015 international wind industry trade fair in Paris, Siemens presented a new offshore logistics concept that reduce transport costs for offshore wind turbines by up to 20%. 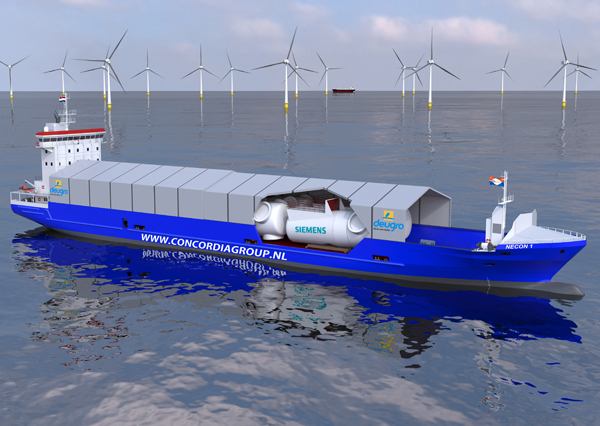 Using a ‘roll-on roll-off’ process, Siemens has utilised two purpose-built transport vessels, which negates the use of large cranes. Siemens CEO of Offshore, Siemens Wind Power and Renewables Division said: "With our new logistics concept for D7 offshore wind turbines, we continue to leverage innovation and industrialisation on our journey to lower the LCoE of offshore wind energy to below 10 cents per kilowatt hour. “Our new production facilities are located directly at harbours to allow advanced Ro/Ro handling and cost efficient shipping of heavy components. This solution will enable us to save up to one fifth of the costs in the transportation chain, depending on the location of the specific offshore wind project." Wind energy drove £1.25bn of investment into Britain's economy last year, with the industry now employing 30,500 people, according to a report from RenewableUK.